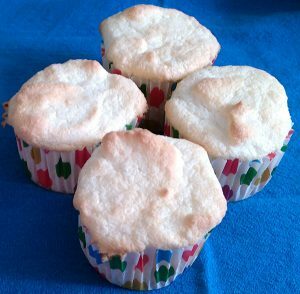 Gluten-Free Angel Food Cake or Cupcakes - Now....you're cooking! I have never been that keen on plain angel food cake, but it makes a great base for other desserts. Lemon Dessert Cake has always been a favourite of mine and I wanted to make it as an Easter dessert. For just my husband and myself I didn’t want to make a whole angel food cake dessert. I have had a set of 6 miniature angel food cake pans forever (they were my grandma’s), so I decided to make individual desserts. I don’t know if you can still buy these little pans – I made the 6 mini cakes and a dozen cupcakes. I think the recipe would make at least 2 dozen cupcakes, or a full sized angel food cake. 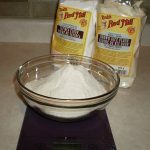 This is my gluten-free flour blend (I tested this recipe with the blend made with Authentic Foods flours.) I used a carton of egg whites for simplicity, and to avoid having a lot of egg yolks left over. Preheat oven to 350 degrees F. If making cupcakes, line muffin pans with paper liners. Place flour and icing sugar in food processor bowl and process for 30 seconds (or sift 4 times - I don't have a sifter). Set aside. Place egg whites, salt and cream of tartar in stand mixer bowl. (Be sure bowl is clean and grease free to ensure that the egg whites will beat properly.) Using the whip attachment, beat until foamy. Add vanilla and continue to beat until egg whites have increased in volume and are thickened. With mixer running, gradually spoon in white sugar and continue beating until whites form soft peaks. Remove bowl from mixer, and with spatula carefully fold in flour mixture, ¼ at a time. Use a light hand to ensure that the egg whites don't deflate. Spoon batter into tube pan(s), or muffin tins. Bake in preheated oven until lightly browned and top springs back to the touch. About 15-18 minutes for cupcakes, 30-50 minutes for a (full size) tube pan. Allow to cool in pan. If using a tube pan, invert it (some have legs, or place over a bottle neck if yours doesn't) until cool to keep it from deflating.